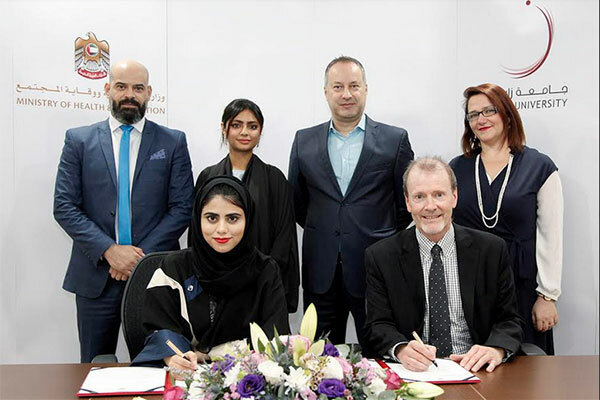 UAE’s Ministry of Health and Prevention (MOHAP) signed an agreement with Zayed University to develop a framework for joint cooperation in research activities, conducting research in the field of health, and studying the economic indicators of the health sector in the country. The signing of the memorandum of understanding (MoU) was held at the Ministry's office in Dubai. The Ministry was represented by Alya Zaid Harbi, director of the Statistics and Research Center, while the College of Natural and Health Sciences at Zayed University was represented by Dr Michael Allen, research assistant. The two sides agreed to carry out joint research activities, share statistical data related to health, participate in conferences organized by the ministry and the university, and support the research committees of the ministry with regard to health sciences and training in research methodology, statistics and vital statistics. Alya Harbi stressed the importance of the MoU with Zayed University in establishing cooperation between the two sides, exchanging experiences, facilitating training, data and studies related to the development of the health situation in the country, improving the level of health research in the country, and promoting innovation and research to make the UAE one of the leading countries in the field of health research. She underscored the Center's keenness to cooperate with universities and specialized colleges locally and internationally, associate with organisations interested in medical and health research for preparing research and studies, work on the exchange of research and medical studies, and develop health services and raise the level of health services in the country. In addition, she said the Center also sought to implement regular health surveys at the country level in cooperation with the World Health Organization or any other local or international entity, in the fields of medicine and public health. Michael Allen said the initiative consolidated the general and comprehensive framework for coordination of efforts and visions that help government decision makers find sustainable solutions to health issues by developing strategic partnerships in specialized research.